1) Fantastic triphasic (eccentric-isometric-concentric) activity of the hamstrings through a functional range of movement. 2) Great gluteal (maximus and medius) activity and stabilization throughout the movement. 3) Appropriate involvement of Janda's "deep longitudinal subsystem" and Myers' "lateral line" (including the peroneals and anterior tibialis in concert with the lateral hamstrings, sacrotuberous ligament and gluteus maximus/ medius). In simpler terms: Awesome co-contraction and integration from the foot/ ankle through the hip and pelvis. 4) An excellent stimulus for torso muscular stability training. Appropriate dynamically stiffness of the torso is much easier and efficient to "drive" though the SLRDL movement pattern then one that is limp wristed. The problem that I have with the exercise is inherent in the fact that most people I see in the clinic generally have multiple impairments, not limited to strength/ contractility, mobility /stability, and balance, all of which will generally disqualify them from going full bore into the single leg RDL. In particular, most, if not all post operative anterior cruciate ligament (ACL) patients are significantly deficient in all of the above, especially early in the rehabilitative process. This study in the Journal of Sport Rehabilitation shed light on significant motor control deficits 12 months after ACL reconstruction, while Howells and colleagues in a systematic review of the literature noted impaired postural control as an issue in post operative ACL patients. So what does this have to do with the single leg RDL? Really in the way it is taught most of the time. Most texts and or instructional videos teach the SLRDL in a "hands free" mode, which while acceptable for many healthy trainees as well as proprioceptively gifted patients (an outlier group for sure). It is the way I taught it for a long time as well, with the expectation that sooner or later most people would catch on to the "correct" technique. Recently, however, I decided that I was wasting both my patient's and my own time by not streamlining the process better by incorporating additional external stabilization, tactile cueing and environmental constraint to facilitate capture of the technique. Below, I give you three simple but effective steps to teach just about anyone how to subliminally slip into the single leg RDL. Keeping the trunk and pelvis level without using the arms for support would have made this much more of a difficult proposition so soon after reconstruction. Here, the pattern gets grooved quite nicely, with the ability to steer posture through the upper body, while the foot learns to make tactile adjustments without having to control the whole chain by itself. As you can see here, we are using a kettlebell in the opposite hand to add load. Weight can be utilized as soon as the athlete/ patient/client demonstrates appropriate trunk/ pelvic control; adding weight too soon can lead to trunk rotation-something desirable for Stuart McGill's excellent "Hip Airplane" exercise, but not the response we are looking for in this particular progression. At this point, we have the outcome we want- appropriate head to toe alignment, good pelvic/ trunk stability and the hinging mechanics we are looking for. More importantly, the patient is now independent in the performance of the exercise-it's his for life. Of course, it will be useful not only in his clinical care, but as a performance enhancement tool after discharge. The single leg RDL is a fantastic exercise, but can be a challenge for certain clients and patient populations to master, namely due to impaired proprioception/ balance and whole system stability. Fortunately, the remedy for this is pretty simple: use your available environment to externally stabilize and groove the movement pattern you are looking for. Rely on upper body support, tactile cues, or whatever other tools you have available to get your patient/ client to understand the basic pattern, then take support away as technique allows. Before you know it, they will perform the way you want independently, with great technique that they now own. The movement is initiated from the "dead hang" position with as neutral a spine as possible. The foam roller helps keep the hip and lumbar spine position "honest" throughout the exercise, which challenges the lats and scapular stabilizers even further. Begin with a strong bracing contraction of the abdominals, then "set" your lats by isometrically depressing your shoulders. Then, pull your knees toward your hands ( the foam roller is key here, as without it, you easily loose the neutral spine position). When your knees pass the straps of the rings, pause 1-2 seconds and control the descent to the starting position. Pause 1-2 seconds, and repeat. One to three repetitions per set is a great starting point, with a set range of five to ten sets per session being adequate for good progress. You can increase repetitions as you wish, as long as technical excellence is maintained. It is best with this type of exercise to leave "one in the tank" so as not to develop a sloppy motor pattern and/or substitution pattern. 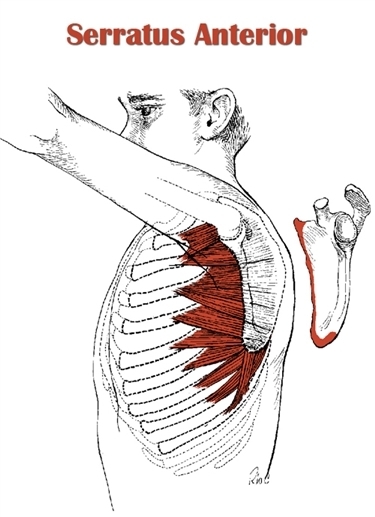 In this exercise, the latissimus act in "reverse action"; that is, the origin of the muscle (at the thoracolumbar fascia) moves toward the insertion (the humerus) in closed chain fashion against gravity- a pretty difficult and challenging proposition. The trunk rotating about the shoulder joint provides different training stimulus versus most "traditional" chin up/pull up progressions. The sternal portion of the pectoralis major also gets some work as a stabilizer, as does the subscapularis and teres major, with the shoulder being internally rotated and adducted. 2) The Abdominals Act as a "Chassis Stabilizer"
Bracing the abdominals (as well as increasing intrabdominal pressure) set the stage for a rigid frame that the latissimus "engine" drives through completion. Again, the foam roller held with the heels/buttocks is really important in the early stages of learning, or you loose a key part of what makes this exercise worth doing. Moving the distal end of the body through space requires a high level of not only abdominal activity, but integrated proximal hip stabilization and significant intermuscular coordination between all moving and stabilizing parts. 3) You Are Taken Out of Your Proprioceptive "Comfort Zone"
The psycho biological/ proprioceptive challenge of overcoming the apprehension of an inverted posture is something that will benefit most trainees. There is a skill component in learning and exercise like this that is more fun than a typical straight saggital/frontal plane movement such as a chin up. When you do this in a commercial gym, the looks are pretty priceless as well! -A trainee who can't perform an "honest" 12 chin ups or pull ups. -Someone who lacks requesite thoracic spine and shoulder mobility. -Those who have fair to poor ability to stablize the core. For those who are ready, though, the "Tewlve to Six" is a great addition to a program that adds a lot of value (as well as a lot of strength) to a solid program.